By Jonathan Moss, Nick Clarke, Will Jennings and Gerry Stoker. Jonathan Moss is Senior Research Assistant for Geography at the University of Southampton, Nick Clarke is Associate Professor in Human Geography at the University of Southampton, Will Jennings is Professor of Political Science and Public Policy at University of Southampton (Academia.edu, Twitter) and Gerry Stoker is Professor of Governance at University of Southampton (Twitter). Their project ‘Popular Understandings of Politics in Britain, 1937-2014’ is funded by the ESRC. This Sunday marks the 70th anniversary of the 1945 General Election. The election is widely understood as a significant turning point in modern British history. Labour won their first ever majority government and introduced a wide-ranging programme of social and economic reform, including the inception of NHS exactly three years later, and establishing the foundation of a political consensus that was sustained until the 1970s. Yet the meaning of the election has been contested by historians ever since. For some, the 1945 election represented the beginning of a golden age for British politics. By comparison to the present period, turnout was high and support for the two main parties was high. It was estimated that 45 per cent of the public listened to election broadcasts on the radio and large numbers flocked to outdoor meetings to see politicians in the flesh (see Lawrence). Labour’s first parliamentary majority represented the highpoint of post-war enthusiasm and consensus for social democracy. The ‘people’s war’ produced a sense of national purpose and social reconciliation through events including conscription, evacuation, rationing and communal air-raid shelters. Labour’s victory was a consequence of greater public engagement and support for collectivism, planning and egalitarianism (see Field). For others, the election has been remembered with greater enthusiasm than was present at the time. Politicians such as Hugh Gaitskell, Herbert Morrison and Harold MacMillan all remarked on the public’s lack of interest in the election. A 1944 Gallup poll showed 36 per cent of the population believed politicians placed their own interests ahead of country. Labour’s victory was the result of anti-Conservative feeling. The ‘spirit of 1945 was a myth’ and few people voted for Labour because they desired socialism or social democracy. Citizens supported the implementation of the 1942 Beveridge report out of individual self-interest and were indifferent to ambitious projects of social transformation. The majority of voters were disengaged from the political process and cynical about the motives of politicians (see Fielding). Our current research project draws on survey/poll data and volunteer writing in the Mass Observation Archive to offer a new interpretation of this election from the perspective of ordinary people. It is important that we revisit the past to understand political attitudes in the present. Much has been written about the rise of anti-politics in recent years, which presumes a historical narrative that citizens have become increasingly disenchanted from politics, without understanding how citizens engaged with formal politics in the past. Crucially, we revisit 1945 not to answer questions about why Labour won that election, but to explain how citizens understood, imagined and evaluated politics in their everyday lives, and to identify how this has changed in the last 70 years. Our early findings illustrate that citizens encountered politics and politicians in 1945 primarily by listening to long, uninterrupted speeches on the radio, and by attending local political meetings. These relatively unmediated forms of political interaction could expose politicians who lacked character or had little to say. They also provided an opportunity for politicians to impress with their oratory, authenticity and ability deal with rowdy crowds. Citizens judged politicians on their sincerity, charm, policies and programmes. We also find that citizens commonly understood party politics as unnecessary. Politics involved ‘mud-slinging’ and ‘axe-grinding’, and was something to be avoided. Many did not want the election to take place and wished that coalition politics would continue after the war. Many expressed preference for independent candidates who demonstrated the ability to rise above the ‘petty squabbling’ of party politics. So how should we remember the 1945 election today? Maybe this was not a golden period for democratic engagement in that negativity towards formal politics was certainly present. Politicians were frequently conceptualised as ‘gift-of-the–gabbers’ and ‘gas–bags’. Yet we should not mistake cynicism for apathy. Remembering the 1945 election, we should think about the everyday rituals of political interaction that permitted citizens to criticise, but also appreciate some politicians’ character and capacity to make effective collective decisions on their behalf. Returning to the present, we should consider how political interaction has changed over the last 70 years, and examine how this has influenced ordinary people’s decisions about participation in formal politics. This research is funded under the ESRC research award ‘Popular Understandings of Politics in Britain, 1937-2014’ (Nick Clarke, Gerry Stoker, Will Jennings and Jonathan Moss). See further details here. There is a polarity at the heart of British politics that is triggered by anti-politics. Both Ukip and Green supporters share a deep sense of disillusionment with the political class and functioning of British democracy. In almost every other respect, though, their grievances with what is on offer from the political mainstream diverge – leading to polarities that require both Labour and the Conservatives to defend against an attack from both their left and right flanks. The mainstream parties recognise the threat but are in much more of a bind when it comes to how to respond than they understand. First the political disenchantment at the heart of Ukip and Green support means that their voters have stopped listening to mainstream parties to some degree and second the polarity of Green and Ukip positions means that if mainstream parties try to appease one set of voters they run the risk of simply driving others away from them. As part of our ongoing investigation into the causes and impacts of political disaffection, we have undertaken a systematic comparison of the determinants of Ukip and Green Party support, based on the British Election Study’s Continuous Monitoring Survey (2009-13) and Internet Panel Study (2014). Full details of our analyses can be found here (the Ukip analyses replicate earlier work reported here). The results across both periods – which start well before the height of the Ukip and Green surges – are striking. Distrust of politicians is almost as big a factor for Greens as it is for Ukip supporters (it is interesting that this effect is slightly weaker for 2014 as the Greens have picked up more popular support). The odds of someone intending to vote Green or Ukip are up to two and a half times higher (and at a minimum 50% higher) if they express distrust in politicians. People who intend to vote for UKIP and the Greens are also more dissatisfied with British democracy, dislike both David Cameron and Ed Miliband, and more likely to agree that “politicians don’t care what people like me think”. Interestingly, Greens are more likely to accept the view that “it is difficult to understand government and politics”, whereas Ukippers disagree – for them politics is not as complicated as is made out. Even controlling for the demographic and attitudinal factors identified in the popular and widely accepted Ford and Goodwin thesis, political distrust and disaffection is a major driver of support for the Greens and UKIP. The idea that Ukip or the Greens represent a threat is not news to the political parties. Labour’s big data election analyst Ian Warren long since identified the Greens as key to understanding the distinctive geography of the new British politics. And the Tories plainly see Ukip as a major concern. But the standard mainstream party response is to focus on policy red meat that both parties should throw Ukip supporters to win them back. Disaffection with politics means this strategy may not work because those voters are less trusting of politics and so less likely, anyway, to believe the policy crackdowns and inducements they are offered. But appeasing Ukip has in turn created space for the rise of the Greens – though it remains to be seen to what extent their gains in the polls translate into votes on Election Day. Our old politics is struggling to cope with a new world of polar opposites. While they may be disaffected and share distrust in politics and politicians, the attitudes of Ukip and Green supporters differ in important ways. Ukip voters are more likely to be male, aged 55 and over, and read right-wing tabloids. Greens are more likely to be female, younger, and not tabloid readers. Ukippers want to leave the EU are worried about immigration, and tend to be of the view that “ordinary people do not get their fair share”. They also are more likely to think that equal opportunities for ethnic minorities and gays and lesbians have gone too far. Greens on the other hand are pro-EU, more likely to express positive attitudes on immigration, believe that government should be concerned about inequality, and disagree that “too many people rely on government handouts”. They also strongly disagree that environmental protection has gone too far. In contrast to Greens, Ukip supporters tend to be less supportive of redistribution or government intervention, but still care about ordinary people getting a fair deal. They may be hacked off about the economic status quo, but Ukip supporters are not necessarily natural bedfellows for Labour’s brand of redistributive social democracy. These results show that the Left behind thesis that the demographic of Ukip supporters means they are natural Labour voters has perhaps been overplayed – the set of policy attitudes that they express would be just at home in the “new working class” identified by Ivor Crewe in Thatcher’s heyday. These people once may have voted for Labour and Tony Blair – in the guise of “Mondeo Man” – but their policy and cultural attitudes are distinctive and not social democratic in any way. By trying to placate voters’ concerns about immigration and the EU, parties may well have driven voters into the arms of the Greens – who are the polar opposite to Ukip supporters on crucial cultural and policy attitudes. Further Greens and UKIP supporters are not “insurgents” in any normal sense of the word (they are unarmed as far as we know!). They have a clear set of ideological dispositions and policy preferences that are not being met by the political parties or within the political system as it currently stands. That those preferences are at polar opposites highlights the impossibility for both Labour and Conservatives of mollifying both sides. Their impact on rising support for the new forces in British politics simply highlights the lack of discussion about the underlying attitudinal cleavages that are giving rise to these disparate political movements and the extent to which they are reshaping the political map. In a Public Policy @ Southampton briefing in Westminster today (slides here), Will Jennings and Gerry Stoker present evidence and analysis on the phenomenon of anti-politics and its likely impact on the 2015 General Election. 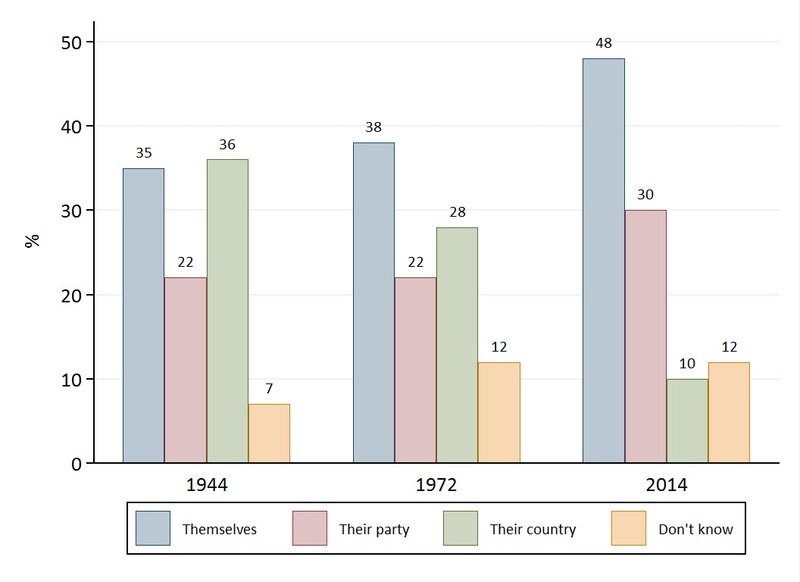 The “anti-politics” phenomenon is complex but is reflected in negative attitudes towards mainstream politics and political parties among citizens. A void has grown between politicians and citizens and we here present longitudinal survey evidence to support that claim. It’s fair to say politics has never been that popular among British citizens. In 1944, 36% thought politicians were mainly out to do the best for their country, in 2014 that figure had dropped to 10%. It is driving support for UKIP. The odds of someone voting UKIP are three times higher if they express distrust in politicians. When you include political distrust in a range of models based on the popular and widely accepted Ford and Goodwin thesis, political distrust has the second biggest single effect of any variable – beaten only by wanting to leave the EU (i.e. distrust of politicians has bigger effects on likelihood to vote UKIP than demographic factors, concern about immigration and dislike for the main party leaders). In short our evidence suggests that UKIP support is more about disillusionment with politics than any great cultural gap or lost voters. It is distorting the choices open to citizens as politicians duck difficult issues given their sense of not being trusted and the marketing rules that dominate the practices of political elites. The policy menus on offer are being distorted by politicians’ perceptions of what is acceptable and unacceptable to say, and aimed at the people who are involved in formal (electoral) politics. Debates about the deficit, austerity and public spending at the core of the General Election are replete with distortions, half-truths and fail to give citizens a real sense of the choices they face. Political disillusionment does not mean that citizens have no faith in politics, the issue that citizens have is with the current practice of politics. Our 2013 survey evidence reveals that 63% still think that politicians in government can make a difference and 52% think that they have access to the technical know-how to do so. The problem is that the way that politics is done. Some 80% of citizens that that politicians are too short-termist and focused on chasing favourable headlines, while 72% think they are too self-seeking and beholden to rich and powerful interests. When it comes to thinking about solutions it’s difficult to imagine that mainstream parties could lead the change but that is exactly what is required. The answer is not to move onto the territory of populist challengers but instead change the way that politics is offered and give citizens real choices. After the election we need citizens’ commissions to be set up so that cross-sections of the public can lead the reform process towards a better politics. UKIP’s supporters show the classic signs of populism in their backing of the party. The dynamics of populism drive its beneficiaries in terms of voting support on a trajectory where surge is followed by slump. Predicting when the former will stop and the latter start is not possible as it depends on a complex set of contingent factors but that the implosion will occur for UKIP at some juncture is a racing certainty. Populism is an embedded element in the culture of contemporary democracies. It is ready to emerge and be exploited because of a gap between widespread understanding of democracy and the rather the pragmatic reality of its everyday practice. The vision of democracy as rule by the people implies precisely that the wishes of the people will find expression in the policy and practices of government. Citizens in the grip of populism tend to assume that the public has one voice and that it is theirs; since all reasonable people would agree with their commonsense views. Democracy in practice is messier as different interests compete to achieve compromise through backroom deals and special interests use their influence to get deals done on issues that matter a great deal to them. The gap between the visionary ideal of democracy and murky realities of its practice provide fertile ground for populism. The failures to achieve the people’s will is down to malevolent forces: a corrupt political elite, their cosy media friends and the influence of powerful unaccountable forces. Only by ridding ourselves of “them” can “we”, the people of commonsense, get back “our” democracy. UKIP supporters are populists in much of their outlook as a number of recent surveys tell us (see Table 1 below). More than other citizens they think politicians are out for themselves and beholden to powerful interests. They are happy to see themselves and the party they support as outsiders to the clubby and stitched-up world of Westminster politics; claiming a bias in the news coverage and the media against them more than others. In that sense many more UKIP supporters are prepared to view the current system of politics as a waste of time. In UKIP world they are the challengers or as UKIP expert Matthew Goodwin puts it Nigel Farage is “leading a modern peasant’s revolt against Westminster”. The populist dynamic that is driving the surge of support for UKIP, garnering the support of the disillusioned rather than the disengaged voters), is capable of and likely to eventually turn in on itself. The gap between the democratic ideal in the heads of their supporters and the messy reality of modern democratic politics remains in place and it provides a trap for UKIP to fall into. So when UKIP supporters see their political heroes backing the interests of big business, or when their elected representatives appear as craven as others and when simple solutions to complex problems cannot be delivered, disillusionment will drive down the party’s support just as it drove it up. Or when self-interested internal power struggles dominate media coverage of the party the drift in support can lead quickly on to implosion. In Australia, Pauline Hanson led her populist One Nation party to remarkable success in state level elections in Queensland and secured over 9% of the vote in the 1998 federal elections. Hanson’s demise was swift, however, and in the 2010 federal election One Nation polled less than 1% of votes. The established mainstream parties are not easy to shift; not least in part as they can occupy some of the issue and policy ground claimed by populist challengers. Some claim that UKIP are fast becoming the Teflon party of British politics immune from media exposure of scandals affecting it because its base reflects a value or cultural rejection of liberal Britain and a sense of deep distrust of mainstream political parties and their media allies. The survey evidence backs up the scale of distrust held by UKIP supporters but our argument is that the Teflon factor should not be overplayed; distrust of one group of political actors can quickly spread to others. One time beneficiaries can become a target, ask Mr Clegg. Because UKIP is a party of populism it must live and die by its rules. Those rules predict a surge followed by a slump as scandals, exposure of political self-interest and failures of delivery take their toll. The bookmakers would be well advised to offer considered odds on that possibility as well as the number of seats that UKIP will earn in May 2015 general election.